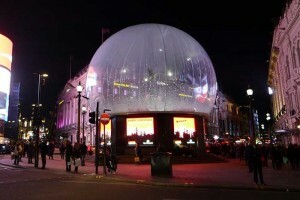 With London enjoying the busiest time of the year during the Christmas and New Year period, Westminster City Council have taken the decision to install a giant ‘snow globe’ to protect the Shaftesbury Memorial and Eros statue in Piccadilly Circus. The replica snow globe, designed by Wildstone, and constructed by fabric structure experts Architen Landrell, includes an 11m inflatable PVC membrane that adds festive sparkle to the area whilst keeping the statue and monument safe from excitable revelers. The base of the globe, formed into an octagon shape, features eight high resolution LED screens supplied by XL Video. The screens, formed from tiles of high-brightness Pixled F-6, are covered by 6mm of acrylic to protect the LED from the elements. 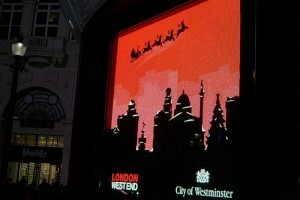 The screens display a range of content including Christmas greetings and sponsor messages from Microsoft, Fiat, JD Sports, Canon, and assorted theatres. The globe is now live in Piccadilly Circus until the start of 2014.